In 2013, 14.1 percent of Washington residents (967,282 people) were living in poverty, up from 13.5 percent (915,278 people) in 2012. Two other states, New Jersey and New Mexico, also saw significant increases in their poverty rates and number of poor residents during this period. 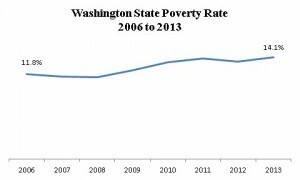 “This increase in the poverty rate alongside higher income inequality shows that the economic recovery has not reached many low-income Washingtonians,” said Jennifer Romich, director of the West Coast Poverty Center at the University of Washington and an associate professor of social work. New Jersey and Washington were the only two states where both poverty and inequality – how inequitably income is distributed – increased. North Dakota saw the number of poor people, but not its poverty rate, increase, while four states – Colorado, New Hampshire, Texas and Wyoming – saw their poverty rates and/or numbers decrease. In the remaining 42 states and the District of Columbia, poverty rates and the number of people in poverty were unchanged from 2012. “The poverty rate is an indicator of how well the most vulnerable do in our economy. The overall national picture suggests that economic growth is failing to reach everyone,” Romich said. Poverty rates vary widely across the state of Washington. For example, Kitsap and Island counties had a poverty rate of 11.3 percent, while 20.8 percent of Yakima County residents were estimated to be poor. 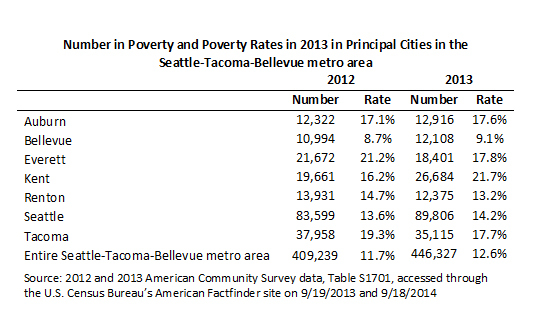 As a whole, the Seattle-Tacoma-Bellevue metropolitan area had a lower poverty rate (12.6 percent) than the state, but some cities within the metropolitan area, such as Everett and Tacoma, face higher poverty rates. The estimated median household income in Washington for 2013 was $58,405, unchanged from the last two years. For comparison, in the nation as a whole, median household income rose in 14 states and remained unchanged in 36 states and the District of Columbia. Median income in the Seattle-Tacoma-Bellevue area was $67,479, giving the Seattle area the sixth-highest median income among the nation’s 25 largest metropolitan areas. Income increased for middle- and upper-income Washingtonians, with the largest gains going to households in the top 5 percent of the income distribution. Income for the bottom 40 percent of households was statistically unchanged. As a result, income inequality in Washington state increased between 2012 and 2013. Income inequality increased significantly nationwide and in 14 other states. For more information, contact Romich at romich@uw.edu or 206-372-7034.